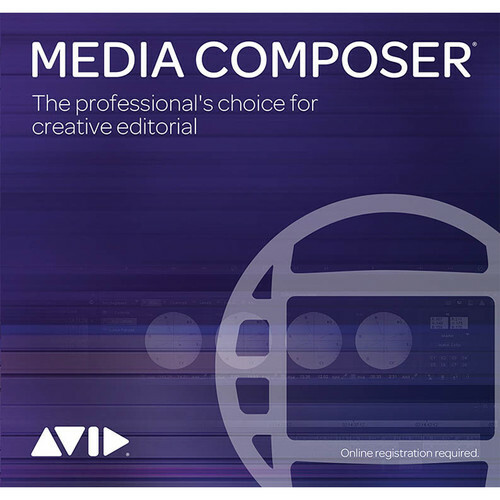 Avid Media Composer 2018 professional video editing software is designed with ACE-certified tools and timesaving workflows and allows you to edit everything from SD to 8K and higher, HDR, stereoscopic 3D, and a wide range of file formats, camera formats, and codecs without transcoding. Offering 64-bit performance, Avid DNxHR and Avid Resolution Independence technologies, and background rendering and transcoding, Media Composer 2018 allows you to work with high resolution, high frame rate media efficiently. The program features 24 video tracks, visual effects, green screen composites, motion effects, transitions, color correction tools, and graphical titles and animations. It allows you to preview clips before committing them to a project, edit multicam projects, and automate non-creative media tasks, such as transcoding, consolidating, and relinking. The application also lets you record, edit, and mix up to 64 audio tracks in 7.1 channel surround sound, create groups to mix dialog, Foley, music, and sound effects more easily, and polish soundtracks using the same audio effects and sound processors used in the popular Avid Pro Tools audio application. Media Composer 2018 includes a variety of plug-ins and supports many more. Users of Media Composer 2018 get access to the Avid Marketplace directly from the software. Here you can purchase additional plug-ins, add-on options, stock footage, and more. Add-on options include the Symphony Option and ScriptSync Option. Media Composer 2018 also supports multiple control surfaces and other hardware add-ons for a more advanced and professional workflow.